Also, please explain how gun registration and “tracking gun ownership” have anything to do with public safety. What would that do? The largest mass shooting ever perpetrated in history was done in Norway by a man using a Ruger Mini 14. He killed a very, very large number of people in short order. In one day, over a few hours he killed 69 people and wounded 110 after setting off a bomb that killed 8 and injured over 200. Aside from that example: the 1999 shooting at Wedgewood Baptist Church in Texas, leaving seven victims dead and seven wounded; Oregon’s Thurston High School in 1998, leaving four dead and 22 wounded; the 1993 Long Island Railroad shooting, leaving six dead and 19 wounded; the 1991 Luby’s massacre, leaving 23 victims dead and 20 wounded; and, a 1987 shootout at a Florida shopping center, leaving six dead, including two police officers. Not to agree with the original poster, as I understand millions have been sold since 1973 and maybe only a few hundred really bad eggs have gotten a hold of them. I think responsible civilians should be allowed to own and operate weapons like the Mini 14 freely. The Mini-14 does not utilize “clips”. It is a semi-automatic, not automatic, so your rate-of-fire criticisms do not make a lot of sense in this context. It’s not a military-issue nor “-style” weapon — it’s marketed to ranchers. Shootings are not occurring at an increasing rate. Gun deaths of all types including mass shooting events have plummeted by roughly 50% since the 1990s. Only media coverage has increased. No other variables have increased. As a social scientist it’s really difficult to watch people ignore real tangible epidemics (such as drug addiction and child neglect) and become hysterical about non-existent epidemics such as shooting sprees (despite television coverage, we are in a “golden age” with rapidly declining shooting deaths). It’s not just wasted energy — you are willing to sacrifice essential human freedoms in exchange for absolutely nothing because the problem you’re trying to solve does not mathematically exist. More importantly, as someone with an internet connection and Google, I wonder how you can be so lazy and irresponsible. It takes 5 minutes, max. You sound like a very sensible person. I wish more people would use their brains and do research on stuff before sharing stuff on social media that could be bs. The AR pictured above is an XM177E2, not an M16. You state that it’s not a good self defense rifle, but at the same time point out that it’s a light weight remarkably accurate killing machine with little recoil, sounds like an amazing home defense rifle, and an amazing rifle for being in the woods with. 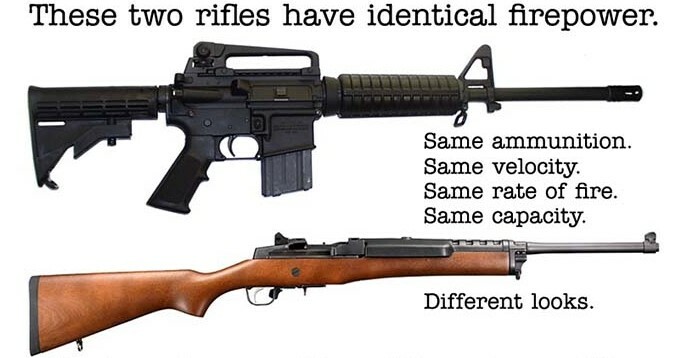 And somebody who claims to have been in the military I’d hope know the difference between a rifle such as the mini 14 vs the military grade assault weapons that requires an FFL lisence which is very costly and time consuming and hard to get not to mention the cost of the weapon itself. Furthermore, the fact that a firearm shares a caliber with another is not grounds to condem the rifle, that is just pure ignorance, for example, a Browning M1919 machine gun and a Remington 700 both use 30-06 cartridges, VERY DIFFERENT WEAPONS. And further more, firearms do not kill people, people kill people, wars would not happen without people, murder and mass shootings would not happen without people, and if we start banning things based on certain events, we should also outlaw cars, knives, gasoline, planes and so on…. this article is not fact, it’s propaganda.